As I write this in late June, 2012, Congress is once again in a crisis mode over extension of the Highway Trust Fund Reauthorization bill. The last long term authorization expired in September 2009. Since then, there have been nine temporary extensions, usually for three months each. If no extension is passed by Congress and signed by Obama by June 30, the Federal government will no longer be able to reimburse State governments for its share of highway projects underway, no new construction or maintenance projects would start, and 3,500 federal workers (mostly in the Federal Highways Administration) would be furloughed. Right now (on June 28) it appears Congress will pass legislation tomorrow to reauthorize the highway spending for a little over two years (to the end of FY2014). A compromise was reached among the key negotiators yesterday, which resolved the immediate stumbling blocks. For example, the Republican House had tried to attach controversial and unrelated additional measures to this high priority bill to require approval of the Keystone XL oil pipeline (even though the environmental review of the recently revised route has not been done), and to declare that coal ash should not be treated as hazardous waste (despite what scientists might say on it being hazardous). But these additional provisions were dropped. In the bill as now drafted, federal expenditures would continue at the current rate of $54 billion a year in nominal terms. But the compromise legislation still provides no long term solutions to the key issues. The fundamental issue is money. The basic problem is that while everyone recognizes the critical need to build up and maintain our highway and other transport infrastructure, there has been an unwillingness to raise the taxes needed to pay for it. Republican leaders today repeatedly cite Eisenhower and the Interstate Highway System that was launched under Eisenhower as exemplars of what America should do. But the Republican leaders have been completely unwilling to consider setting gasoline tax rates at the levels they were in real terms under Eisenhower when the Interstate Highway system was launched. The problem is that while the system of funding centers on use of taxes on gasoline (and other fuels, such as diesel) to pay for the highway improvements, the fuel taxes are structured to fall steadily over time in real terms. The fuel taxes have been set in terms of some fee per gallon sold (currently 18.4 cents per gallon for gasoline), but these taxes are not then adjusted for inflation. The current 18.4 cents per gallon rate was set in 1993, but general prices are now more than 50% higher than they were then. Hence general construction costs will be higher by about this much, and the money raised will not go as far as it did back then. Hence needed projects do not get funded, congestion increases, maintenance is neglected, and our highways and bridges deteriorate and fall apart (sometimes dangerously so, with bridges collapsing). Highways in America were once the best in the world, but no more. 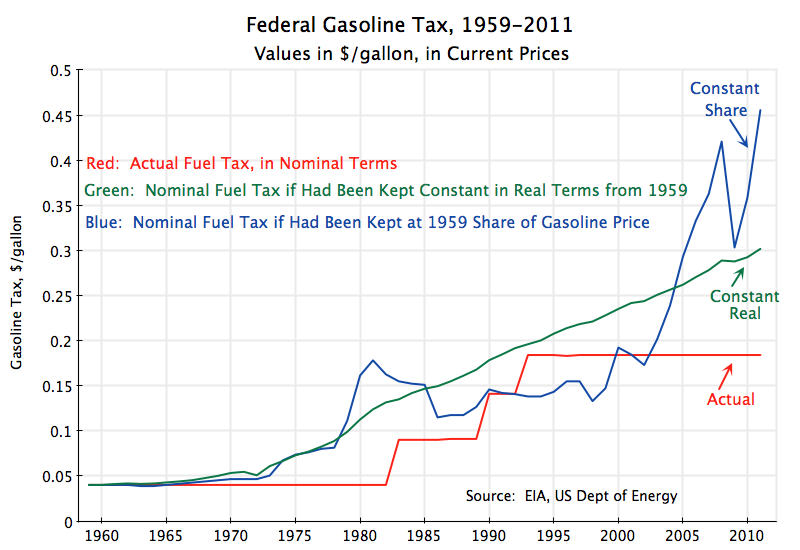 The graph above shows what federal gasoline taxes have been since 1959, in dollars per gallon. The data is from the Energy Information Agency of the US Department of Energy and from this special report of the US Department of Energy, coupled with a history of gasoline taxes from the Federal Highway Administration, and inflation data from the Bureau of Labor Statistics. There are also fuel taxes at the state and sometimes local level, which will be in addition to the federal taxes, and these taxes are significant. But the focus here is on the federal tax, as it is the federal tax which funds the federal government payments for highway construction and maintenance. Federal gasoline taxes were in fact originally imposed in June 1932 by President Herbert Hoover, at a rate of 1.0 cents per gallon (equivalent to 16.2 cents in prices of 2011) which was raised to 1.5 cents in June 1933 (equivalent to 25.4 cents in current prices) and then reduced to 1.0 cents again in 1934. But these taxes were considered part of general government revenues, and were not earmarked to be used solely for highway construction and maintenance. This changed during the Eisenhower Administration, with the approval in 1956 to build the new Interstate Highway system. Gasoline taxes were raised to 3.0 cents per gallon (they were at 2.0 cents at that point), with these taxes and other taxes (on other fuels as well as on rubber for tires and on sales of new trucks) allocated to a new Highway Trust Fund. The Highway Trust Fund would be used to fund the federal share of the new Interstate highways and other federal highway projects (and later, under Reagan starting in 1983, a share would be used for mass transit projects). As construction ramped up, the tax was raised to 4.0 cents per gallon in 1959. A tax of 4.0 cents per gallon in 1959 would be equivalent to a tax of 30.2 cents per gallon today, in current (2011) prices. But while there were several increases in the fuel tax (to 9.0 cents in 1983 under Reagan, to 14.1 cents in 1990 under the first Bush, and to 18.4 cents in 1993 under Clinton), the increases did not suffice to make up for inflation. And since 1993, the tax has not been changed, and hence has diminished in real terms because of inflation. The graph above shows in the green line what the fuel tax would have needed to have been (in terms of the current prices of the year) to have kept it steady in real terms at the level of 1959 under Eisenhower. The actual fuel tax (the red line) is always below that, and sometimes far below, as it is now. With such a gap, it should not be surprising that there is a shortage of funds to pay for highways, and their now decrepit state not a surprise. Another way to structure the tax would have the tax as a constant percentage of the price of gasoline. Regular sales taxes are always set as a percentage share of the value of what is bought, and there is no reason in principle why fuel taxes could not be also. The graph above shows in the blue line what the tax on gasoline would have been had it been set at the percentage share that 4.0 cents per gallon represented in 1959. That share was 12.9% (based on the average retail gasoline price of the year). There is more volatility in this line, as gasoline prices have been volatile, especially in recent years. For 2011, the tax would have averaged 45.5 cents per gallon. This is well above the actual 18.4 cents rate. However, the tax rate would have been lower between 1993 and 2000 and again in 2002. While there is some logic to structuring the fuel tax as a constant percentage share of the price of gasoline, a major drawback is that fuel tax revenues are needed for highway construction and maintenance, and the costs of building or maintaining highways is not closely linked to the price of gasoline, but rather to general prices. Adjusting the fuel tax rate for general inflation rather than for the price of gasoline (as is implicitly being done with the tax at a constant share of the price of gasoline) will be more likely to produce revenues linked to the cost of construction. One can see from the diagram at the top that had the fuel tax been set at a constant share of gasoline prices, the rate would have been almost the same in 2002 as in 1980, over two decades earlier. Yet the general price level was more than double (117% higher to be more precise) in 2002 than in 1980. Highway Trust Fund revenues of $60 billion would have more than fully funded the $54 billion per year that is currently being spent, and would continue to be spent under the draft reauthorization bill that might pass tomorrow. But everyone agrees that the $54 billion level of spending is far below what is needed. A 2009 report by the commission established by Congress to examine the issue, the National Surface Transportation Infrastructure Financing Commission, estimated that federal government spending on what is now being covered by the Highway Trust Fund would need to total between $92 billion and $119 billion per year (over the period 2008 to 2035, in 2008 constant dollars), simply to maintain the system as it is now. For the system to improve, federal spending would need to total between $118 billion and $150 billion per year. Hence even $60 billion per year would not suffice, even though this is far higher than the $36.9 billion collected in FY2011. A case could be made that the tax per gallon should be higher than what it was in 1959 in real terms during Eisenhower’s Presidency. Many would argue the tax should be a dollar per gallon or even more, both to fund the needed highway improvements, and to cover the pollution and congestion costs that result from gas users not paying to cover the costs they impose on others. A tax of a dollar per gallon would raise $200 billion per year at current (2011) usage rates, but presumably (and hopefully) usage would be reduced somewhat with a tax on use at this level. But even if usage fell 25% (the fall would likely be less), revenues would still total $150 billion per year, or enough to cover fully even the high end of the estimated $118 to $150 billion range cited above on how much needs to be spent for the highway system to improve. But touching the current 18.4 cents per gallon gasoline tax rate is considered politically impossible, and that may well be correct. Hence dedicated revenues for highways falls each year in real terms, and what is spent to maintain and improve highways is kept well below what is needed. It was noted above that the current reauthorization bill constrains spending to just $54 billion a year. With revenues from the gasoline (and related fuels, tires, and new truck sales) coming to less than this ($36.9 billion in FY2011), the difference has to be found from other sources. The current reauthorization bill illustrates the types of tricks that are used. Some funds will come from the Leaking Underground Storage Tank Trust Fund. I know nothing about that fund, but suspect it does not have an excess of money. A bigger part will come via a change in accounting rules that corporations would now be able to use for their pension obligations for their workers. The easier rules would allow underfunded pension obligations to become even more underfunded. The result is that the corporations would then be able to show a higher near term profit, as they would not need to record the same level of transfers to the pension funds. The corporations want this. And with the higher profits, there would be higher corporate profit taxes paid to the government, and the government would then count this as revenues to cover the highway expenditures. This is of course short-sighted. The pension obligations will remain, and will simply become even more underfunded than they are now. Eventually this will need to be covered, unless the corporation goes bankrupt and reneges on its pension obligations. If it does, the Pension Benefit Guarantee Corporation (PBGC) would be responsible for covering at least part of these pensions. But the PBGC already has greater obligations than it has funds to cover them. While the highway reauthorization bill will also authorize a rise in PBGC fees, it will also count these fees as part of the “additional” revenues to fund the highway construction. As the saying goes, “this is no way to run a railroad”. Or fund building of highways. This entry was posted in Economics Applied, Fiscal Issues and tagged infrastructure, policy, tax system, taxes, US politics by aneconomicsense. Bookmark the permalink.